For the better part of 30 years, my family and I have traveled to Dayton, Ohio for the week that follows Christmas. We go there to visit with family, catch up with friends and enjoy each others company. Having lived in East Dayton while I went to college, I have always been struck by a community that must have been beautiful in its heyday, the early twentieth century and perhaps as recent as the 1960’s. Much of East Dayton today consists of remnants of once beautiful neighborhoods, small tool shop businesses to include small factories and striking churches, especially several Catholic churches. Decades ago East Dayton likely looked like many mid-western city communities; a blend of well-to-do neighborhoods and low-to-middle income neighborhoods that were the fabric of America with small corner stores and people that looked out for each other. Today, many of these communities are trying to hold on and hoping for better economic times while trying to find businesses to invest in their city and find a path back to prosperity. East Dayton is nestled into the Five Rivers part of Dayton that is starting to rally around a beautiful single A baseball stadium where the Dayton Dragons play, a Cincinnati Reds affiliated team named Fifth Third Park. It borders Five Rivers Park and the city has begun to beautify the area with walking bridges over the rivers, nice landscape and a Technology Park to attract businesses. There are even newly developed Town Homes being built where old factories once stood and are being torn down. There are many remnants of hard times with dilapidated buildings, closed businesses and areas that have been ignored for far too long but hope and revitalization is underway in several parts of East Dayton. After being a frequent visitor over the past four decades, it is nice to see change, investment and new possibilities for this part of the Gem city. It looks promising and I hope it continues as America seems to have advanced the notion it is time to invest here at home for a while. 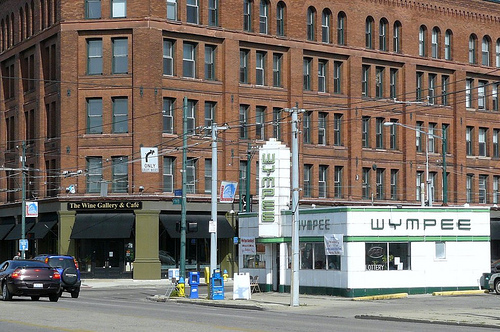 I love that former industrial cities–like Dayton, Cleveland, Pittsburgh–are re-inventing themselves and people are beginning to breathe life into the old neighborhoods by choosing to move there. Improving schools and security, and giving folks tax breaks and parking, is a formula for success. Thank you for providing this good-news story. Next Next post: Bravo Zulu!